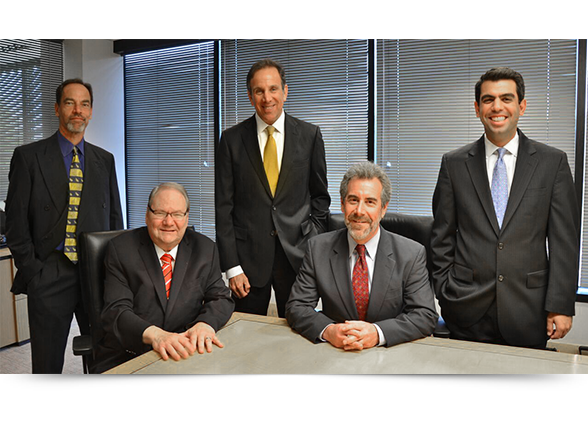 Distinguished Personal Injury Attorneys serving Maryland, Virginia and Washington D.C.
At the law firm of Karp, Wigodsky, Norwind Kudel & Gold, P.A., we are proud to have been nationally recognized as one of the top tier law firms in the United States. The firm continues to be ranked in the Top Tier Best Law Firms by U.S. News-Best Lawyers for Personal Injury litigation. Ron Karp: What do his fellow lawyers say about him? Listed in 2017 as one of the Top 100 Super Lawyers in both Maryland and D.C. (where there are over 100,000 lawyers). Selected again to Best Lawyers in America, a listing of the top 1% of the lawyers in the United States. Selected, by invitation only from his peers, as one of the Top Ten trucking lawyers in the State of Maryland, by the National Trial Lawyers Association. This follows multi-million dollar results in trucking accidents, including one in 2017. 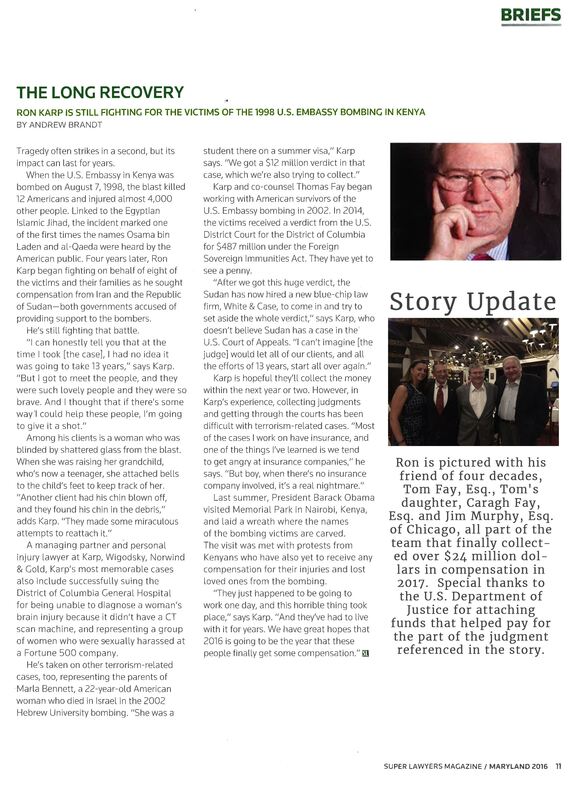 BREAKING NEWS: : RON’S TEAM COLLECTED $24 million dollars in 2017 on behalf of U.S. State Department victims. READ THE STORY. Ron was also featured in The Daily Record, read a copy of the story on our BLOG. Jeff Wigodsky: ALTHOUGH CASE RESULTS DEPEND UPON A VARIETY OF FACTORS UNIQUE TO EACH CASE AND DO NOT GUARANTEE OR PREDICT A SIMILAR RESULT IN ANY FUTURE CASE UNDERTAKEN, with more than 30 years of experience, Jeff Wigodsky has represented more than 10,000 injured victims, secured over $100 million in settlements and recently settled a case for one million dollars. Lee Norwind has successfully handled major cases for over 35 years and has been recognized by his peers in Maryland, the District of Columbia, and throughout the United States as one of the nation’s premier trial attorneys. Selected as a “Super Lawyer”, Mr. Norwind has the experience, knowledge, passion, and compassion to achieve success while standing by his clients until justice prevails. He focuses his practice in the areas of trucking accidents, personal injury/wrongful death, professional malpractice, injury claims against the federal government, and major case litigation. Mr. Norwind serves as Maryland’s representative on the National Advisory Board of APITLA ,the leading organization that represents the interests of truck accident victims and advocates for safe trucking practices, and is a member of the prestigious Belli Society, an invitation-only group of trial lawyers dedicated to the principles of education and justice. He is a past-president of the Trial Lawyers Association of Metropolitan Washington, DC and a founding member of the DC Chapter of the American Board of Trial Advocates. John P. Kudel emphasizes the representation of individuals charged with all criminal, traffic and juvenile crimes in the State of Maryland. Mr. Kudel has been practicing law in Montgomery County, Maryland since 1980 and has more than 36 years of litigation experience in the criminal and civil courts of Maryland, the U.S. District Court for the District of Maryland, and the United States Bankruptcy Court. Since 2006, Mr. Kudel has repeatedly been recognized as one of the best criminal defense attorneys in the Washington Metropolitan Area by Super Lawyers, which is based on voting by other lawyers and a blue ribbon panel. Mr. Kudel was elected President of Maryland State Bar Association in 2011 and served his term as President from 2012-2013, followed by a term of Immediate Past President from 2013-2014. Mr. Kudel continues to serve on the Maryland State Bar Foundation. Jack Gold has a proven track record litigating in appellate courts over the past two decades, including cases against major corporations, insurance companies, hospitals and healthcare providers, the District of Columbia, and the Washington Metropolitan Area Transit Authority (WMATA). The courts’ decisions in a number of these cases resulted not only in justice for the firm’s clients, but also helped countless other individuals have their day in court. Demosthenes “Demo” Komis is a trial lawyer who excels in the courtroom. Having successfully tried cases to verdict in Maryland, Virginia and the District of Columbia, Mr. Komis understands the complexities of trial, from jury selection to closing arguments, and consistently presents winning cases to juries. Demo litigates a wide variety of cases, including wrongful death, trucking, and medical malpractice cases. Of Counsel: Lisa Marie Riggins. Former prosecutor and wife of NFL legend John Riggins is resident in our Rockville office. We have an extensive history of pursuing justice for those who have been injured in trucking accidents in Virginia, Maryland, and Washington, DC. We are committed to assisting the best recovery possible for those who have been victimized in this way. Nobody ever gets into a motor vehicle thinking that they’re going to end up in a crash. For many of us, being cautious drivers comes naturally. Unfortunately however, there are still many drivers on the road who take their driving privileges for granted. Dedicated to the pursuit of justice for people in Maryland, Virginia, and the District of Columbia who have suffered due to the misconduct, negligence, or malice of others, we consistently focus on obtaining justice for TBI victims and their families. Our attorneys are frequently selected by colleagues to be included in listings of Best Lawyers in America, Super Lawyers, and The Washingtonian. Members of the legal profession consistently applaud the quality of our work, awarding each firm partner the prestigious AV® Preeminent™ Peer Review RatingSM by Martindale-Hubbell®, the highest rating available for professional competence and ethical integrity from the nation’s most respected attorney rating service. We are especially honored by these selections and high ratings because they are based upon interviews and recommendations by other legal professionals. Our firm’s philosophy is to seek solutions through negotiation, settlement, arbitration, or mediation before litigating a matter in court. But, when a case cannot be satisfactorily resolved without resorting to litigation, we pride ourselves on our detailed case presentation, unparalleled trial experience, and impressive record of appellate victories. Our seasoned litigators have won many notable cases in both federal and state courts and have an outstanding record of appellate victories. The lawyers of Karp, Wigodsky, Norwind Kudel & Gold have co-counseled landmark cases referred to us by attorneys in New York, Chicago, Boston, California, Florida, Pennsylvania, Texas, and New Jersey in addition to the District of Columbia, Maryland, and Virginia. We are proud that more than half of our major cases were referred to us by other attorneys who trust us to represent their clients. For years we have represented lawyers, judges and public officials who have many law firms from which to choose, but were confident in choosing our firm. We are most proud, however, of the privilege to change the lives of thousands of clients without titles or positions of power who have sought our help. Whether your injury involves extensive medical records relating to a brain surgery, or a web of state laws and federal trucking regulations affecting the commercial transportation industry, we have the legal knowledge and expert resources to gather the evidence we need to analyze your case and to effectively present it in a court of law. When a catastrophic auto or truck accident suddenly occurs, or when you or a loved one suffers a traumatic brain injury, the aftermath is not only tragic and emotionally challenging, but confusing as well. Injured victims and their families are often faced with very difficult decisions during the most challenging circumstances of their lives. Determining who to trust, what your rights are, and where to turn for help, can be difficult. Our team of skilled Maryland attorneys and medical experts have the knowledge and resources to protect the rights of victims and families in need and get you on the road to recovery. We have a proven track record of aggressively and successfully pursuing the negligent individuals and companies responsible for your injuries, and earning the full compensation you need. Contact us today at (800) 229-7026 or online for a free initial consultation. To better communicate with clients whose first language is not English, we have attorneys and staff members who speak Spanish, French, Italian, Portuguese, Arabic, and Korean.